Right out of the box, this is a beautiful work of fine craftsmanship. 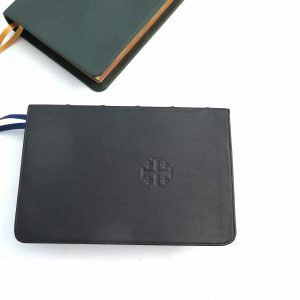 The black leather cover is soft to the touch, stiff enough to retain the volume’s shape, and flexible enough that handling the Bible is not cumbersome. The stitching is flawless, with no loose ends to ravel. The binding seems strong and unlikely to fall apart easily; the binding lays flat, even when only a few pages are turned. When viewed directly, gilt edging is visible, but this changes to a rose hue when the pages are fanned. The front matter consists of a presentation page, Epistle Dedicatory and translators’ notes, and table of contents. Though they are, unfortunately, unevenly spaced in the binding (all falling within the Old Testament), the navy ribbon markers are a great tool for keeping one’s place. The text of the Bible is laid out beautifully. The type size is easily readable, similar to what many publishers consider large print. Decorative drop capitals adorn each chapter; ruby ink is used for chapter headings, drop caps, and verse markings. Self-pronouncing text is a valuable feature for those who are considerate enough to read the names correctly. The Psalms are single-column, but the remainder of the text is double-column. Cross-references are included as footnotes instead of center-column format; for readers used to Bibles with a center line, it may take a little time to adjust to the small space between the two columns of text. The footnotes are center-aligned, the only flaw I can spot in the book. There is a little bleed-through of text in the white spaces, but it is slight compared to many other Bibles; lines are aligned on each side of the page to prevent this from marring the text itself. Holman Bible Publisher’s glossary of “King’s English” terms and concordance follow Revelation. The concordance includes more references than found today’s most common Bibles. A few lined pages for notes are included. Schuyler’s Bible maps are in vivid color and are easy to read. A useful map index follows, for which the publishers should be applauded. The sturdy matching box ensures the Bible is pristine, and it is a suitable tool for keeping the dust away when storage is desired. Overall, I am very pleased with this Bible, and I look forward to years of using it as my primary preaching and reference edition. I was looking for a high-quality, easy-to-read reference Bible, and this one seems to fit everything I wanted. I believe Schuyler has set a new standard for the beauty and quality of reference Bibles, and I am glad to find it in the King James Version. Excellent Bible! The quality of publishing is unsurpassed. The typeface is one of the best, and it is very easily readable. I have thoroughly enjoyed my reading of the Canterbury KJV. I am not a fan of lined pages at the back of the Bible. To me, it does not seem necessary, and it thickens the volume. The maps are excellent. I would like to see them come out with a handier Bible: one that is easily portable. The size and thickness of this Bible limits it to home and church use. This Bible is well done, and is certainly worth the price. Got mine today. I have goatskin bibles and calfskin. This calfskin is of the best and it’s much less expensive than goatskin. The whole bible is very well made. The print is very easy on the old eyes and the red print is of just the right amount with no distraction from reading. I like the paper. Pages are not stuck together like in some bibles. I really appreciate the glossary in the back. Overall this bible is to me a great value in calfskin. Many bookstore bibles cost nearly as much without near the quality. It’s like having a premium product at everyday cost. 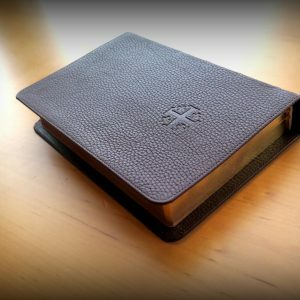 Just received my Schuyler Canterbury KJV in black calfskin. At $95 delivered to my front door step, this was a very economical purchase. 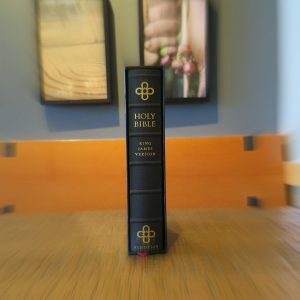 I had complete confidence with this purchase based on all the other Bibles I have ordered from evangelicalbible.com, regardless of the brand. It arrived just in time for Christmas as well. I am presenting it to a grandson for Christmas. The other reviews have accurately described the quality craftsmanship of this Bible, so I won’t repeat those points. As for the value of this calfskin Bible, let me say that I bought a calfskin Cambridge Concord Reference Edition, Red Letter in 1997 for $95. My Cambridge, full of 20 years worth of personal notes, is falling apart at the seams, so I have used that as an excuse to purchase several new goatskin Bibles as a replacement, but just look at the value of this new calfskin Schuyler, for the same price, nearly 20 years later. Wow. While it is a black letter edition, the font is just as large as my old Cambridge Concord, and the overall dimensions the same. I have looked for a new Cambridge Concord with these same dimensions, but all of the new Concords are smaller (Page size: 5 1/2 x 8 1/4 inches,) with smaller type (Typography: 8 pt Times Semi-bold 421.) This Bible fits the bill perfectly, as far as dimensions (Page size: 6.125″ x 9.125″,) and font size (Font: 11 pt. Milo. ) This Bible is just as readable as my old Concord. I’m thinking my 10 year old grandson will find it just as readable. Another feature I really like are the Subject Titles interspersed throughout the text, which lets the reader know what that particular section of the text is talking about. Of course, in the Cambridge Concord, the subject titles are at the top of each page. The Schuyler adds many more subject titles, which is a plus as far as I am concerned. The maps are some of the best I have seen, and the concordance is a great improvement over the Cambridge Concord. It is very neatly printed and easy to scan down through the columns, to find the word for which you are searching. 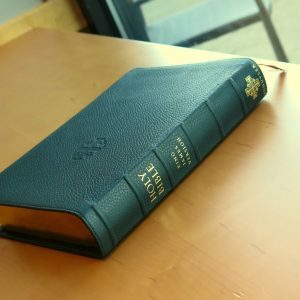 The bottom line is, for this price, you will not find another calfskin Bible with more beautiful craftsmanship, printing size, and Bible helps for $95. I will be ordering a goatskin edition for myself, and more calfskin editions for my other grandchildren. I received my Canterbury today and was not at all dissapointed. The size, the texture, the font, and of course the price, as I got the calfskin version, ( which my mother purchased for me, for my birthday) were much more than I expected. I like to read the NKJV, NASB and ESV regularly and don’t know but would like to have a Schuyler for each. The craftsmanship is superb, and I would very Highly recommend this Canterbury to anyone. The Font is very easy on the eyes and is really for me hard to put down. Thank you for producing this fine Bible, its a keepsake item and know I will use it regularly. Keep up the good work Schuyler, youre doing a fine job. Awesome! I have waited for this Bible for about a year now since I heard that they were working on it. 2K/Denmark did an awesome job on typesetting this one, as well as Jongbloed on the Printing job. The finest people make the finest Bibles. I could hardly believe that it finally arrived today, Christmas Eve. I thumbed through it immediately and noticed the section just after Revelation called “The Kings English” this should come in handy for some of those harder old English words. The concordance is great also, it has the headwords printed in the same red color that drop caps, Chapter numbers, and the Verse numbers have in the main text. There are 12 Maps and they are very good quality like National Geographic Maps, with a map index the next few pages after the maps. Very good! The Bible is a large Bible, and I love it because it is easy to read, the text is large, although it is not considered a large print Bible. The paper is very thin but strong. It looks and feels like it will hold up for generations. This Bible is so beautiful that I hesitate to even put my name in it. And can’t even think of marking in it now. If you are contemplating on buying one of these, don’t hesitate. The Quality is good and the price is good also. You won’t be disappointed. There is none other like it. This was a gift for my mother. She’s never had a premium bible so she was happy. The readability caught her instantly. I got her 2 other bibles, but this one by Schuyler is the latest and greatest! I took one star because the paste down liner disappointed me. It has come unglued on the front cover (about a 1/4 inch are)a. It won’t affect reading, etc…. Just wish it was leather lined. I’ve got two more coming, one more gift, and goatskin for me! Lol. Gotta love Evangelicalbible.com! well executed version of the most beautiful words ever spoken or written. I see this fellow thrice weekly, and he is going to find out exactly what Luke 2:11 means TO HIM, personally. Stunningly beautiful! This Bible is beautiful. The craftsmanship is tops. I will use this Bible for a long time. Thank you Evangelical Bible for this high quality Bible. Absolutely beautiful! The calfskin is supple but just right for reading in bed. The print is excellent in size and sharpness and even the feel of the paper is awesome. Sometimes you can’t describe quality but you know it when you have it in your hands. We know the true value is what’s printed on the pages but from a worldly perspective of quality and cost, this Bible is probably the best value on the market. Truly a beautifully made Bible, and very worthy of the praise given to Schuyler for first class workmanship. I bought this for my parents who celebrated their 67th wedding anniversary two days ago. Their first comment was how easily they could read the text, after that how smoothly the pages could be turned. 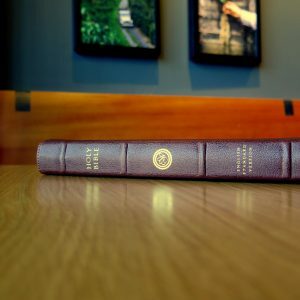 Between them they have over 175 years of Scripture reading completed, this Bible has clearly been their best reading experience and the best made Bible they have ever handled. Thank you EB and Schuyler! 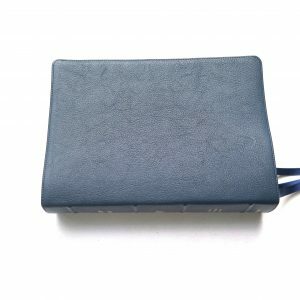 Any opportunity for an outlet in the UK? This is my third Schuyler Bible to purchase, but even though delivery was flawless, international postage is expensive. Just recieved my new Canterbury KJV today, I Love it, the text font is perfect for my eyesight, calfskin it wonderful to the touch, light enough to hold while I teach and preach. The look of the drop caps are great, the edging, the maps, everything about the Canterbury KJV bible is wonderful, I’ll use it till I wear out or it does, Thank you Schuyler for this master piece. This is a wonderful edition of the KJV Bible, overall the best I’ve personally ever seen. I own several top of the line editions of Bibles, and this one is right up there with the best. For anyone wanting a durable, easy to read print size, beautiful KJV, I highly recommend you consider this Bible. It is constructed in a way that honors the precious content, the word of God, that it contains. This Bible is available in both calfskin (the one I have) and goatskin covers. The text block inside is exactly the same in both, so both are equally lovely and easy to read. The print is a nice 11 point size (large print) making it very readable for those of us with less than perfect eyesight. The paper is better and a little thicker than that in most Bibles. The text is in double columns with each verse starting on a new line. The Psalms are in single column as is appropriate for poetry and songs. There is enough space between the lines of print to make reading it easier on the eyes. The references are at the bottom of the page, which I like a lot better than taking up room in between the columns of text. Each chapter begins with a deep red ornamental drop capital, adding a beautiful, antique-looking touch which is very appropriate for the KJV translation. 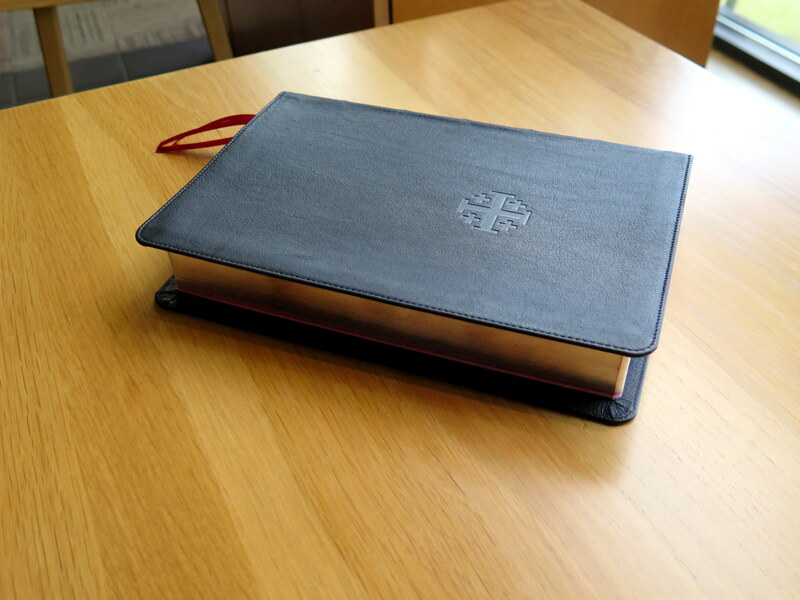 The calfskin cover is just amazing–very flexible, smooth, and durable, nothing like those cheaper, shiny, stiff “genuine leather” covers on some Bibles which cost almost as much. There is stitching around the edge which is a premium detail. Currently $100 less than the goatskin version, this Bible is a great value, much higher quality than similarly priced Bibles in bookstores. Both versions have durable sewn bindings and lie open easily from cover to cover. The inside lining of the calfskin cover is a nice synthetic material. The goatskin edition has an inside lining that is leather, attached a little differently, and the ribbons are slightly wider. Those are the only differences other than $100 in price. Either is a Bible of family heirloom quality and a joy to read. Both editions have beautiful art gilding on the page edges, a coppery toned red under gold gilding. 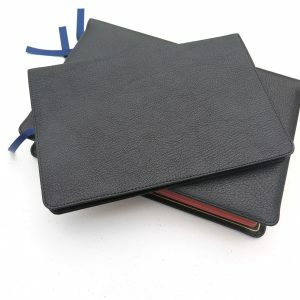 There are three ribbons, navy blue on the black calfskin edition. There is a glossary of words that have changed in meaning (such as “suffer”, “conversation”, etc.) since the KJV was translated, a nice concordance, and maps. It also includes the translators message to the reader in the front, along with a presentation page. There are some lined pages in the back for those who want to take notes, but fortunately these add only a hair to the thickness of the Bible. This is what I would call a larger hand-held Bible. It is not a thinline or compact version, but its size is still easy enough for my small, female hands to hold and read. To make it smaller, the print would have had to be smaller and the paper thinner. The words of Christ are not printed in red, but if that matters much to you, I suggest not letting that be a deal breaker because everything else about this Bible is so much better than most other editions. 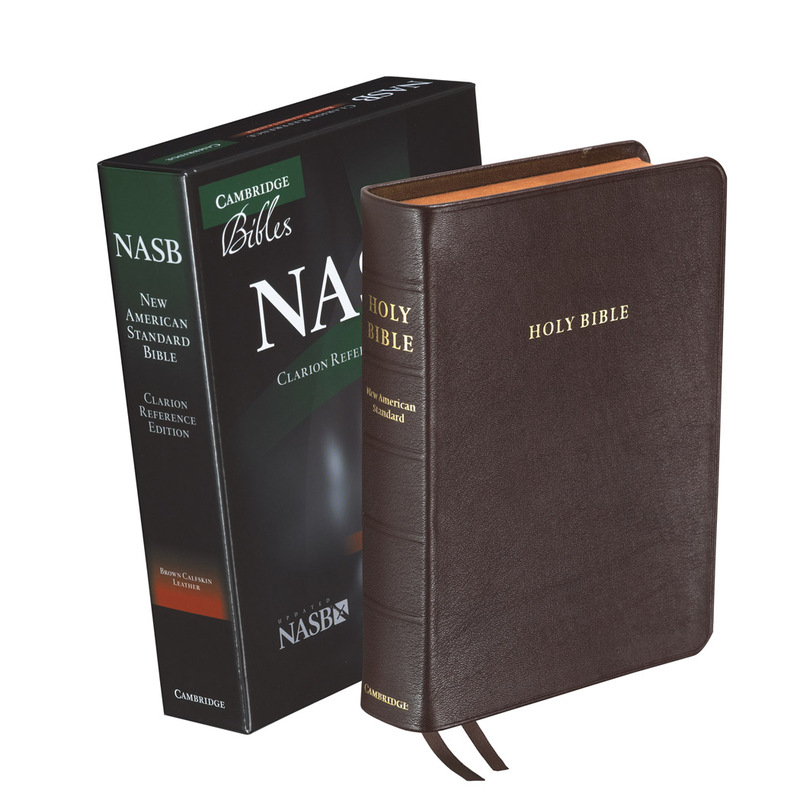 This is a very high quality KJV Bible and a huge bargain in the calfskin version. It’s easy to see why the Canterbury is selling so fast. Although I first wanted the currently out-of-stock deep red cover, the black calfskin was in stock, and I’m very glad I bought it. This Bible has the features to please both the collector of high-end Bibles who may obsess over every little technical detail of construction, and for the average person who just wants a very nice, easy to read Bible to use everyday and perhaps pass on to the next generation. 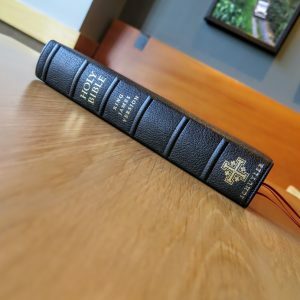 Evangelicalbible is a Christian company that has great customer service, and they will let you return the unmarked Bible if you aren’t pleased with it. Nice people with nice Bibles, God bless. I loved the Canterbury Bible just wish it came with red letter option. 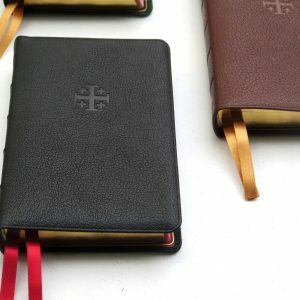 With the exception of the personal size Bibles Schuyler will make soon, the regular sizes of Bibles should all be the size of the Canterbury, in my opinion. Love it in all respects in comparison to Allen or Cambride. My only request is a red letter Calfskin version. 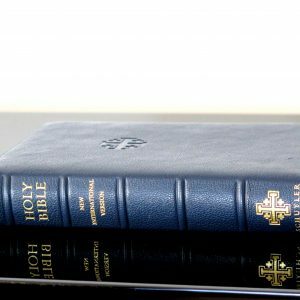 Hey guys, I run a Bible blog which features many KJV Bibles from many publishers. I just received this bible today and I am well pleased. I have many, and I mean many Bibles from many different publishers since I do Bible reviews as well as a Minister, and I have to say this one is far the best Bible I own. The paper quality is superb, the print quality is perfect with no missing ink spots in the lettering which seems to be an issue with many Bible publishers. 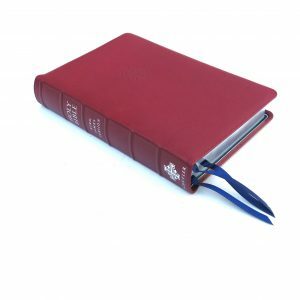 The binding is perfect and is edged-lined which makes the bible very durable. I love this Bible and will be featuring it on my review blog. Thanks guys for superb quality in making Gods word a piece of art. The Schuyler KJV Canterbury is what a Bible ought to be! You will want to read it again and again, even if it isn’t your preferred translation, because of its superb legibility. Thank you, Schuyler, and evangelicalbible.com for producing such a wonderful tool to enable people to encounter the Scriptures. Other publishers better take notice because Schuyler has raised the bar with the Canterbury. This is a high quality Bible. The binding and quality is top notch! It should last a lifetime. The text is beautiful making it a pleasure to read. Amazingly beautiful Bible! We bought this for our baby boy! This is man’s Christ honoring contribution to package God’s perfect Word in such a beautiful way! And the Bible arrived almost a week early! Amazing service from evangelicalBible.com! I am going to be the odd duck out of the flock here. A few words of explanation. I was raised in a Christian home and taken to church every week. My first Bible was a KJV. I was always a believer, even as a little boy. I professed my faith in my junior year of High School in the midst of the Jesus Movement. Since that time I have never used or looked at a KJV translation of the Bible. Until this summer that is. I have been a pastor for many years. During that time most of my interaction with the Bible was in terms of preparation for a sermon or a seminary class. Reading the Scriptures, just to read the Scriptures was very rare. This summer I started to read again, not for preparation, but just to read and enjoy, and listen to God speaking in his written word. Now I was presented with a problem. The modern versions were not doing anything for me. I may as well have been reading from a phone book. Nothing was sticking to my brain glue, if you know what I mean. I decided to go back to my youth and try the KJV. Not having one I ordered a inexpensive one for $6 dollars off the web, who knows, maybe it would not work as I hoped it would. It worked! I once again could listen to the words, just to listen to the words of the text. I love the cadence, the way it sound in my head and the the way it sounds when read aloud. I can remember what I read much better than before. I still had to look words up. For instance, the word socket. I had pictures of Home Depot dancing in my head. I had to look it up in order to have a correct understanding. I could go on and on. However, that is not the point of this review. I know I needed a more sturdy Bible than my $6 internet Bible. So I Googled on premium Bibles and found Evangelical Bibles. I was immediately attracted to the Schulyer Canterbury Bible. However, the price seemed off putting to me. $200 for Goatskin? I eat goat. $120 for Calfskin, I don’t eat calf, I eat their parents. Yet the text of the Canterbury drew me like a moth to a flame. I was still concerned about the price so I looked at all the options. In doing that I came across the Imperfection option. So I clicked on it. To cut to the chase, I found a Schuyler Canterbury Black Goatskin, with imperfections for $185. The imperfection had to do with the gilt. It has 5 small dings to the gilt on the vertical side of the Bible. The horizontal (top and bottom gilt is perfect. I would have preferred forest green, but I was all in. I made the purchase. I am happy as a clam at high tide! The Canterbury exceeded my expectations in in every way. The 11 point Milo font works with my reading glasses. The Goatskin cover is like butter as is the leather liner on the opposite side of the cover. The deep red that is gold lined on the inside page is wonderful. The text block is all about the Canterbury. It is easy to read, it does not stress the eyes (at least it does not stress my eyes). I like that the references are at the bottom of the page. It makes for an easy read. The King’s word list in the back is a useful feature. The Drop Down Capitals and the single column text for the Psalms are incredible. The Bible came in a pure black box. No markings. Just pure black. It reminded me of the obelisk from the movie, The Space Odyssey, from 1968. I want to take a moment and give kudos to the staff at Evangelical Bible. I spoke with *****. She was wonderful. She answered my every question, with patience and kindness to assist me in making my purchase. Since I am in sales, I asked if there were any other “imperfections” that I should know about. ***** went back into the stacks and found a Blue Goatskin KJV Schuyler Reference Bible that had major water damage to the Gilt. She included that in my order at no addition cost to me. I was somewhat concerned. Can you read it? Is it ruined? What about the Goatskin. Let me tell you. It looks like a well used Bible. I could not be more pleased. I can always send it off to get it re-gilted, if I so desire. I use an Allan ESV predominantly, but I have always loved the cadence and beauty of the greatest work of English prose. This Bible truly brings the beauty of the KJV translation to the attention of the reader. It begs to be read, and invites you to meditate on the richness of the text. The beauty of the font and drop caps does justice to the nature of the translation and to its heritage in the English speaking church. This is a must buy for anyone who loves the experience of reading scripture, especially the KJV. Very nice, The calf skin is okay, it is wrapped in a board, which if I knew, I would have gotten something else. What a great bible this is to own and use daily. Perfect size and very well made. The black calf skin is great. Grab one of these while you still can. I received this bible 3/3/2017 and have used this bible everyday. Not only is this the most beautiful bible I own, but it is holding up better than any bible that I have owned. The binding is like new. I really use this bible, so for it to be holding up so nicely it is a real sign of how well this bible is produced. I love the art caps at the beginning of each chapter and the font size is easy to read. I own Cambridge, Thompson, Westminister, Oxford, and other quality bibles. I have purchased all these bibles searching for a bible that was beautiful and well made. The Schuyler Canterbury bible is the bible for me.